By Andy Wright in Celebrities, Last Night, Science and Tech, WTF? Interest in the mythical beast, who first crept into a generation's subconscious when he upstaged John Lithgow in Harry and the Hendersons, has been running high ever since a trio of hoaxsters froze a lumpen Halloween suit in a freezer and declared it to be the carcass of Sasquatch last summer. 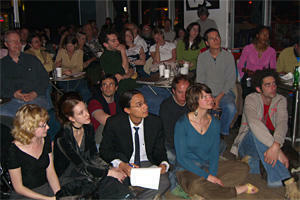 The crowd ran the gamut of young hipsters, the older socks-in-clogs crowd, and the truly eccentric. One man with a long white beard who was waiting in the food and drink line that snaked out of the building opened his jacket to the women in front of him and proclaimed (one assumes in correlation to whatever conversation they were having without him) "Yes, but wouldn't it be cool if they made hats out of these?" Due to the women's polite giggles and smiles, it's safe to assume that nothing illegal had transgressed. The presenter was Berkeley-based Eugenie C. Scott, a physical anthropologist and executive director of the National Center for Science Education. For the uninitiated, Scott helpfully told the crowd that the NCSE dealt with the teaching of evolution in public schools. Pause: "We're for it!" She quipped. Thank you folks, tip your waitresses! Scott has spent her life campaigning for creationism to be removed from school curiculum, and is on the Board of Directors of the Bay Area Skeptics Society. Audience members who were hoping to see a loony tossing about poorly rendered plaster casts of Bigfoot tracks would be sorely disappointed. Scott deftly plowed through a laundry list of reasons it is unlikely the Sasquatch exists. It's been sighted in too many locations, there isn't enough for a creature that large to eat, it conveniently covers its tracks, disposes of its dead, and hides really, really well. And while she allowed that some accounts of Bigfoot sightings were genuinely unexplained, this didn't mean that one should rush to the conclusion that the creature existed. The appropriate answer, she insisted, was a scholarly, "We don't know." One man stood and proclaimed, in an ominous nod to conservationism and cryptozoology, "We're gonna change the earth so much -- it's gonna have no where to hide." Scott seemed understandably unsure how to respond to this statement. A second man asked Scott "what percentage" she thought Bigfoot existed. To drive the point home he repeated, with meaning, "Percentage-wise." "Less then five percent," Scott returned, and then added, "But that's because I'm an optimist." Yet another man, who identified himself as as Bigfoot Field Researcher, wanted to know if the anthropologist thought that everyone who had ever spotted a Bigfoot was participating in a mass delusion. The answer, again, was "No, but that doesn't mean the Bigfoot exists." 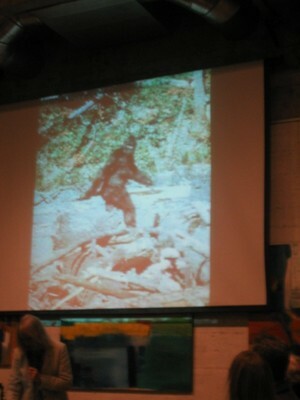 By the time Scott had clicked through a series of slides, including UFOs, Marvin the Martian, this very funny chart illustrating exactly what Bigfoot might be taller than, cast doubt upon the Patterson Video (the Zapruder Film of Bigfoot believers) and gathered up her papers for the evening, any budding Mulders in the audience should have felt a bit deflated. Brandon Kiel, the man who had identified himself as a Bigfoot Field Researcher, however, remained convinced of the animal's existence. He said that he liked Scott's presentation, but that "...some of her facts were not factual." "To say that people spot 12-foot-tall things running around is dismissive," He said "We've never had anybody say they were 12-feet-tall. We know that females are in the range of six feet, eight feet tall and that males maybe top out at nine-feet-tall." Kiel grew up listening to stories of his relatives spotting strange creatures in rural Oklahoma and professes to have seen Bigfoot on two different occasions, once during the day and once with infrared technology. He also said he had worked with famous primatologist, Jane Goodall. "She came to my college in Oklahoma to help students put together the primatology habitat. I worked with her on that. Very vaguely. I was the one that shuttled her around campus and around town." 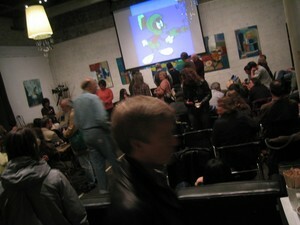 There were undoubtedly audience members who, in spite of themselves, wanted to believe in Bigfoot just like Kiel. Isn't a world with a Bigfoot in it more exciting than one without it? In the end, Scott made the better case. But should another team of flim-flam artists stuff a bear suit in a hollow tree and proclaim it to be the definitive evidence that the creature exists, a lot of very smart people will push aside their understanding of the scientific method just so they can maybe, sort of believe in it, just for a few days or hours. And word to the wise: Keep the height at a believable nine feet, please.